The most recent issue of Trenchless Technology magazine features two horizontal directional drilling (HDD) projects by GeoEngineers. This issue also marks the sixth consecutive year Trenchless Technology has named GeoEngineers in the top 25 of its annual list of the top trenchless design firms. The first feature focuses on a complex HDD project where GeoEngineers designed a 12-inch diameter, 7,700-foot long pipeline crossing under the Mississippi River. Adding to the complexity of the project was that it required drilling under two federal flood protection levees. Boardwalk Louisiana Midstream owns the pipeline and uses it to transport brine from a salt dome on the west bank of the Mississippi River to a chlor-alkali plant on the east bank of the river near Geismar, LA, south of Baton Rouge. For more details, read the Trenchless Technology article “HDD Under the Mississippi River” co-authored by GeoEngineers Senior Principal David Sauls, P.E. and Senior Geotechnical Engineer Drew Sparks, P.E. 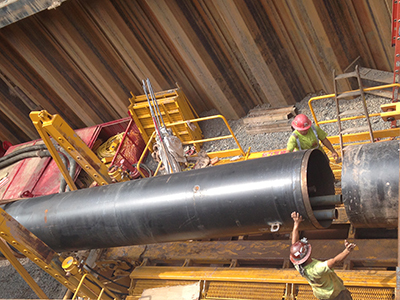 The second feature, which appeared in a special supplement to the print edition of the magazine, is about Tennessee Gas Co., LLC’s first trenchless project using a Direct Pipe® system. GeoEngineers was part of the innovative solution for the project, which included developing a design methodology for curved, jacked steel pipe. The trenchless crossing was completed near Matamoras, PA, along Interstate 84 and US Highway 6. Read the feature story in which GeoEngineers Associate Jon Robison, P.E. is quoted on pages 26-27 of the Trenchless Technology special supplement 2013 North American Microtunneling. Site photo from the trenchless crossing project near Matamoras, PA.